Clubs all over the planet made a racket for World Squash Day as the sport bounced back from its Olympic disappointment to demonstrate all the attributes that make it one of the fastest-growing sports on every continent. World Squash Day 2015 – on Saturday 10 October – united nations large and small, and embraced every playing level from free beginners’ classes to events involving the world’s leading professionals. 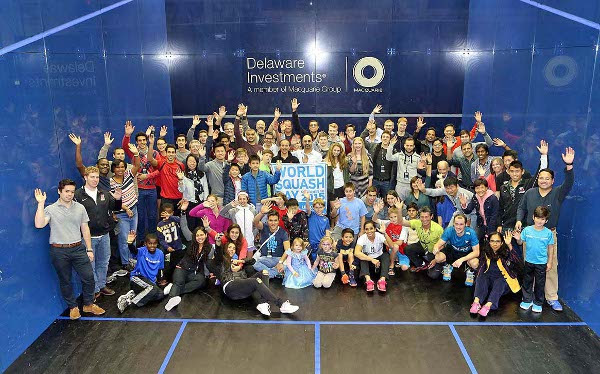 As well as staging events to promote the sport, World Squash Day also raised valuable funds for Unicef, the world’s largest children’s organisation. The Delaware Investments US Open, currently taking place in Philadelphia (WSD enthusiasts pictured above), donated a percentage of ticket sales from the first round of play. There were many innovative projects designed to involve as many clubs as possible. There were some outstanding projects which saw squash academies building partnerships with their local communities. In Malaysia, former world No.18 Sharon Wee held a free coaching day at the University of Malaya courts in Kuala Lumpur. The packed programme, which attracted significant TV coverage, included free sessions for underprivileged children. 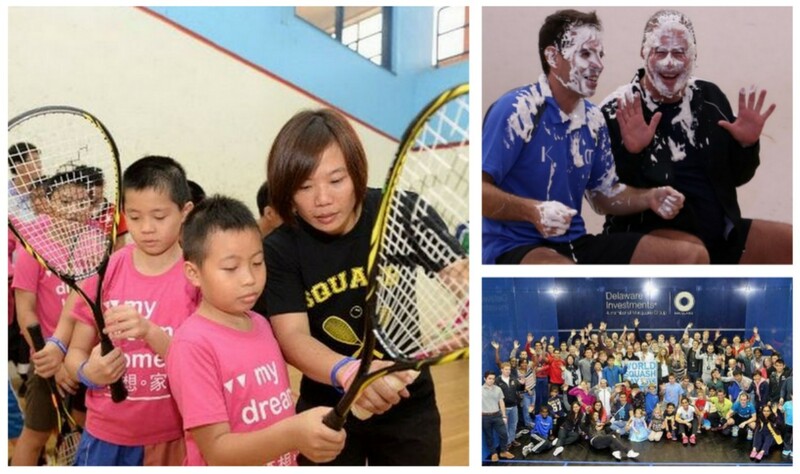 Sharon’s squash academy is championing a youth squash programme dedicated to helping underprivileged children. “We are at the stage of getting the squash community together with sponsors, ministries and the sports council,” said Wee, pictured above. “We’re all very passionate about making this happen. “I promise to pull it through. The underprivileged children deserve the chance to be champions in life and their chosen sport. In the Republic of Ireland capital Dublin, former world No.7 Derek Ryan led Squash Link Ireland on massive cycle ride, stopping off at 20 clubs on the way to play matches against members. A two-day festival at The Mote Squash Club in Kent, England, ended up with coaches Chris Tomlinson and World Squash Day co-ordinator Alan Thatcher each receiving a cream pie in the face (pictured below, left and right, respectively) after their juniors celebrated exceeding their fund-raising targets after serving breakfasts to members. The biggest sum of money was raised for Unicef via a World Squash Day auction set up by Lichfield Squash Club memberJames Roberts, who received some generous bids for items of squash memorabilia donated by star players. A signed shirt provided by England’s three-time world champion Nick Matthew, and a white ball autographed by former world No.2 Jenny Duncalf and Malaysia’s record eight-time women’s world champion Nicol David, both received bids of more than £200. World Squash Day global co-ordinator Alan Thatcher said: “We saw some amazing events take place all over the world, from El Salvador to St Petersburg, and many places in between. 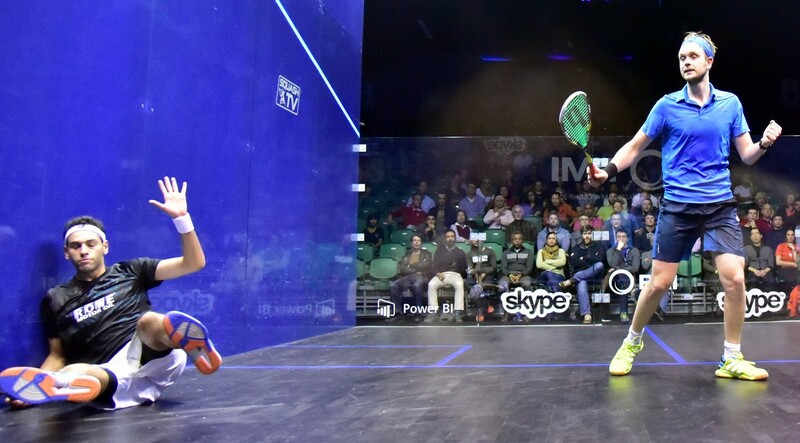 “It was wonderful to see so many thriving squash communities demonstrating the essence of the sport, which is having huge amounts of fun on court, while promoting the world’s healthiest sport and raising significant sums of money for Unicef in the process. World Squash Federation President N Ramachandran added: “World Squash Day has become synonymous with bringing the sport together – and this year was no exception. A range of activities, especially those involving youngsters, are always a key feature, and adding support for Unicef, has made a perfect link.